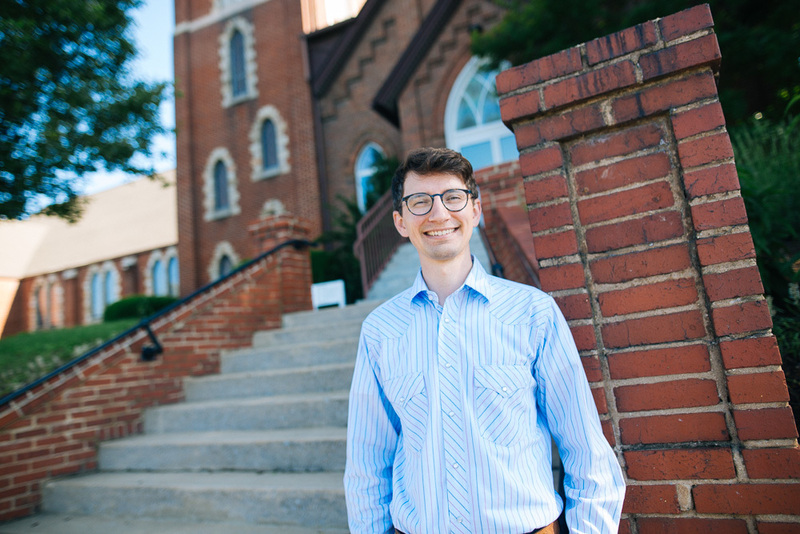 Jordan Luther outside his field education placement site, Community Mennonite Church in Harrisonburg, Va. He is a graduate student at Vanderbilt Divinity School. Graduate school quickly emerged as the most appropriate step for me both personally and professionally after EMU. I was intrinsically motivated to apply to graduate programs because of my love of school. Throughout my studies at EMU and during my gap year, I was hungry to learn. I could not keep my hands off of theology, religion and history texts from the library. I knew that I wanted to go to a graduate program where I could continue to investigate the subtle contours of Christian thought. Graduate school also was a smart decision for me professionally because I wanted a degree program that integrates both academic rigor and ministerial training, which is how I landed in the Master of Divinity program at Vanderbilt Divinity School (VDS). VDS made an impression on me due to its ecumenical status and commitments to social justice. I wanted to be in an environment where I would interact with others who did not bring my same Anabaptist assumptions to the room. I wanted to be in a place where I could stretch myself and engage in conversation with a wider sample of future leaders of faith from across the Christian spectrum on some of today’s most pressing social demands. Describe your field of study and research. 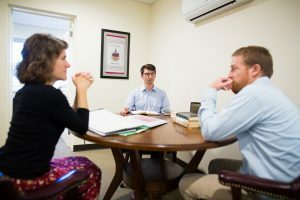 Jordan Luther meets with Pastor Jennifer Davis Sensenig and Associate Pastor Jason Gerlach ’01, MDiv. ’06. 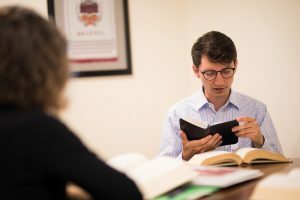 The Master of Divinity degree is the more professional clergy-track route compared to the more research-oriented Masters of Theological Studies degree. My coursework is well-rounded with classes in homiletics, Christian theology, church history, biblical studies and pastoral care providing the foundation of my program. My research concentration, however, is in “Religion and the Arts in Contemporary Culture.” One of my primary research interests is to critically examine how popular culture and media interface with religion. Music, film, and Internet memes have a way of raising everyday theological questions, such as the value of money or suffering, that invite a spirit of playfulness and imagination. I often look to blur the lines in what is conventionally dismissed as “secular” culture in order to see what contributions, critiques and commentaries these artistic expressions are making about religious life. How did your academic studies and professors at EMU prepare you for graduate studies? 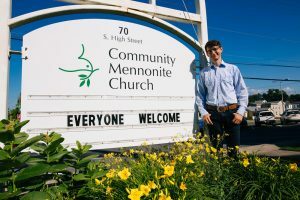 Jordan Luther in a meeting at Community Mennonite Church in summer 2018.
least one question from our weekly reading assignments. Linford modeled for me how to think more like an anthropologist and not to overlook or undervalue the interdependence of religion and culture. Christian introduced me to some of the most groundbreaking literature in philosophy and science. And Carmen stressed the importance of attending to my spiritual life in addition to my intellectual life. So much of my current program relies on knowing how to read, write and speak with efficiency. The strengths of the Bible and religion faculty became critical ingredients that laid a solid foundation for my communication skills. My letters of recommendation were the strongest part of my application, hands down. I felt confident asking my professors to write letters of recommendation for me because of our relationships both inside and outside of the classroom. I knew that they would help to paint a more complete picture of me beyond just my academic potential. What are some of your favorite memories from your time at EMU? Some of my favorite moments from EMU were all of the times that I stood around talking to my peers and professors after class. I love how our class discussions rarely ended with the period, but rather carried over into coffee conversations, long walks or lunch at the cafeteria. The real power of these more casual conversations is that they always seemed to invite at least one or two people from outside of the classroom to weigh in on the topic at hand. I believe EMU embraced a culture that encouraged both a natural curiosity and a spirit of collaboration, which makes all of these little moments and side conversations stand out in my memory. What is your advice to undergraduates? Don’t sell yourself short on the college experience. Everything that you do is an ingredient to help you grow and mature and be a more thoughtful person in the world. Building strong relationships with your classmates, going to special lectures, and getting involved in the broader Harrisonburg/Rockingham area are all invaluable parts of sharpening your perspective. Most of all, take time to review your perspective regularly and document how it is changing in light of these new experiences. I believe it is important to be upfront with ourselves about how we have changed and appreciating the processes that have contributed to our growth. Congratulation, Jordan! It’s great to see what you’re up to. We look forward to hearing more from you as you study, write, and impact the places that God calls you!